Hundreds of different citrus varieties are available for tasting at last year's citrus tasting event. The UC citrus research center swings open its doors this week to give farmers and the public the opportunity to view and taste dozens of mandarin varieties - which in recent years have emerged as Americans' favorite citrus – as well as sweet oranges, lemons, grapefruit, kumquats, blood oranges, tangors and many other types of citrus fruit. The 175-acre UC ANR Lindcove Research and Extension Center is situated where the valley and Sierra Nevada foothills meet in eastern Tulare County. 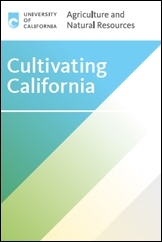 Research conducted at the center plays a major role in maintaining California's position at the forefront of high-quality citrus production for markets throughout the United States and the world. Citrus Industry Day - Dec 12: From 9 a.m. to 12 noon, citrus growers, pest control advisers and other industry professionals are invited to taste citrus fruit at their leisure, discuss new low-seeded mandarin varieties with UC Riverside plant breeder Mikeal Roose, and consult with UC Cooperative Extension advisors Neil O'Connell of Tulare County and Craig Kallsen of Kern County. At 10 a.m., UC Riverside plant pathology specialist Georgio Vidalakis, director of the UC Citrus Clonal Protection Program, will explain the center's role in providing the citrus industry with disease-free citrus propagative material. Immediately following the CCPP presentation, UC Riverside principal museum scientist Tracy Kahn will lead a tour of the Lindcove demonstration orchard and discuss new citrus varieties. General Public Day – Dec 13: From 9 a.m. to 12 noon, Lindcove is open to the public. In addition to citrus tasting, there will be a special activity for children and the opportunity to consult with UCCE Master Gardeners about backyard citrus horticulture and pest management. The tasting event is free. Visitors wishing to take home samples of Cara Cara, Washington navels, mandarins and assorted fruit, may purchase a tote bag full of fruit for $5. All funds raised by the bag sales will supplement educational activities at the center. 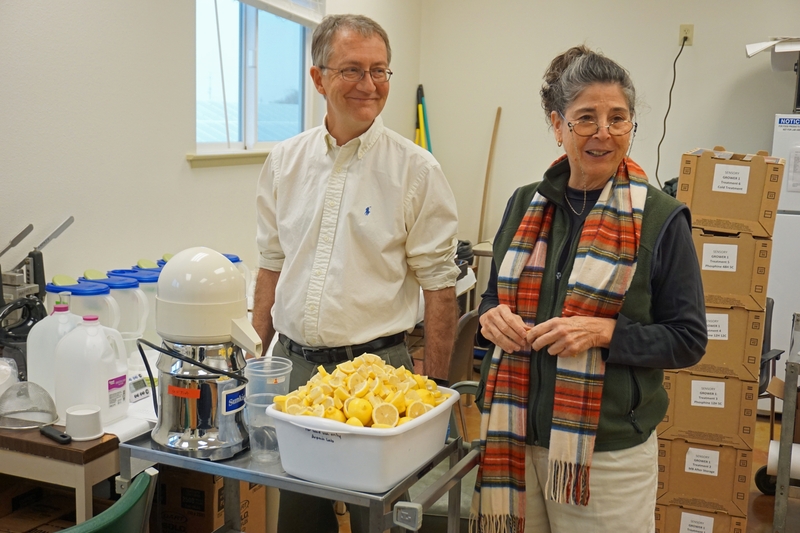 At both events, Mary Lu Arpaia, UC Riverside post harvest specialist and David Obenland, plant physiologist at the USDA-ARS San Joaquin Valley Agriculture Center, will be inviting visitors to participate in a research project that involves taste testing of citrus fruits. The weekend's events mark the launch of Lindcove's Conference Center Outdoor Enhancement Campaign. 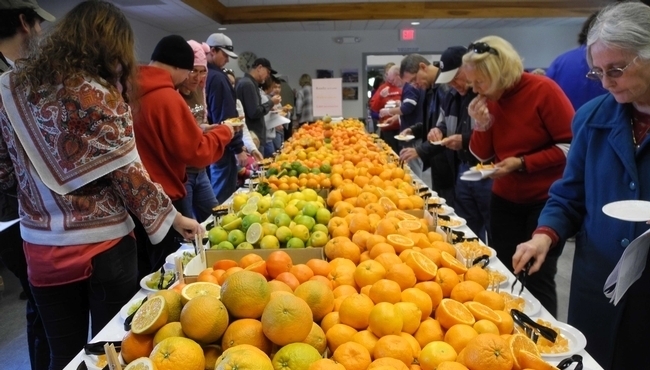 Funds will be used to upgrade the conference center parking area, plant demonstration orchards and add an outdoor amphitheater where school children can learn about citrus. The Lindcove Research and Extension Center is at 22963 Carson Ave., Exeter. The tasting takes place in the conference center building, located at the end of Carson Ave. on the right. 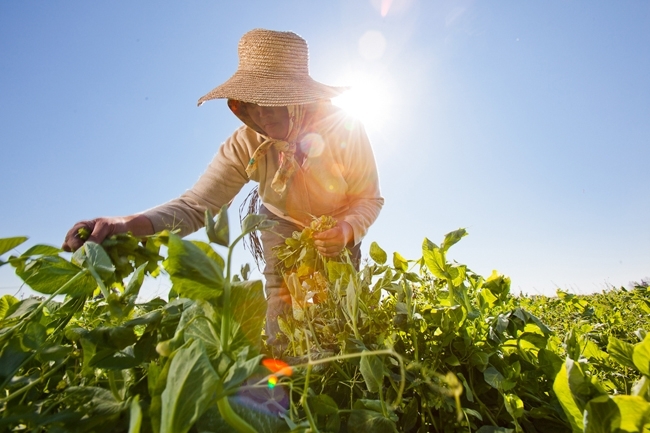 For more information about the tasting events, contact Anita Hunt, (559) 592-2408, ext 151, amdhunt@ucanr.edu. One of the hazards of contributing to a shared blog, is that one forgets to post. So in this case, while I said in my last post that we would re-visit the lemoncello in mid-May, here it is September. Time flies. The lemoncello is a huge success, we've been enjoying it on the hot summer afternoons that are plentiful in Davis. And here's how I got from pith to pleasure . . . . 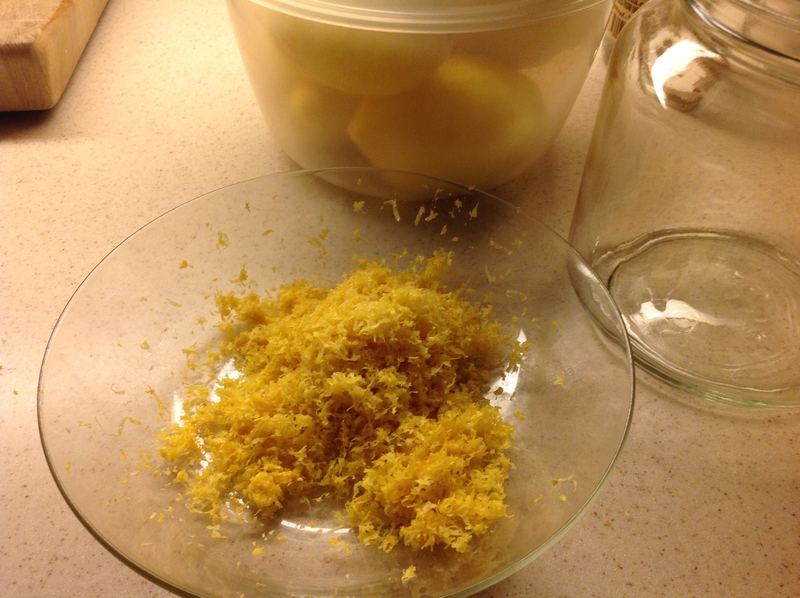 The first steps in the lemoncello process were documented in this early Spring post. The recipe calls for 6 weeks of steeping the lemon zest in the alcohol in a cool, dark place; preferably, in a place where it won't be disturbed. I had placed mine in a place so cool, dark, and undisturbed it took me 45 minutes to find it. But that resolved, I moved to the next step - filtering. 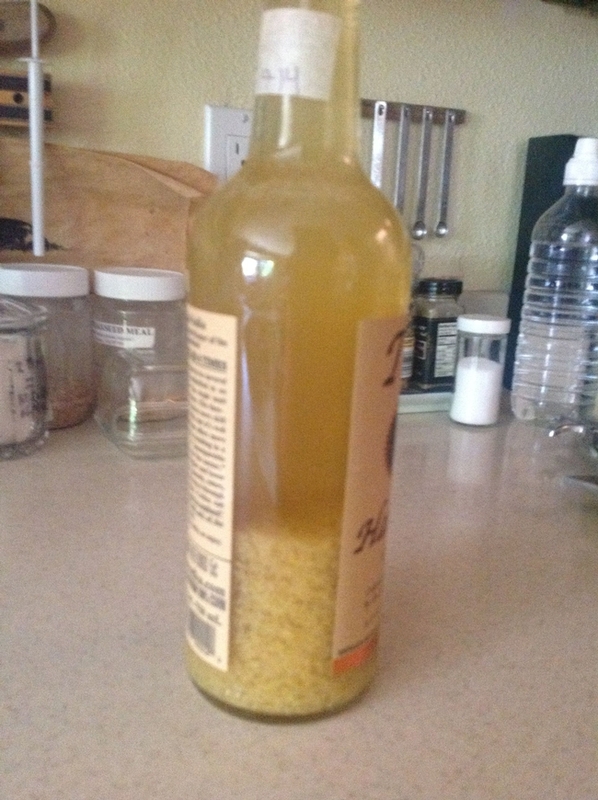 You can see that the zest from all of those lemons has settled to the bottom of the bottle. 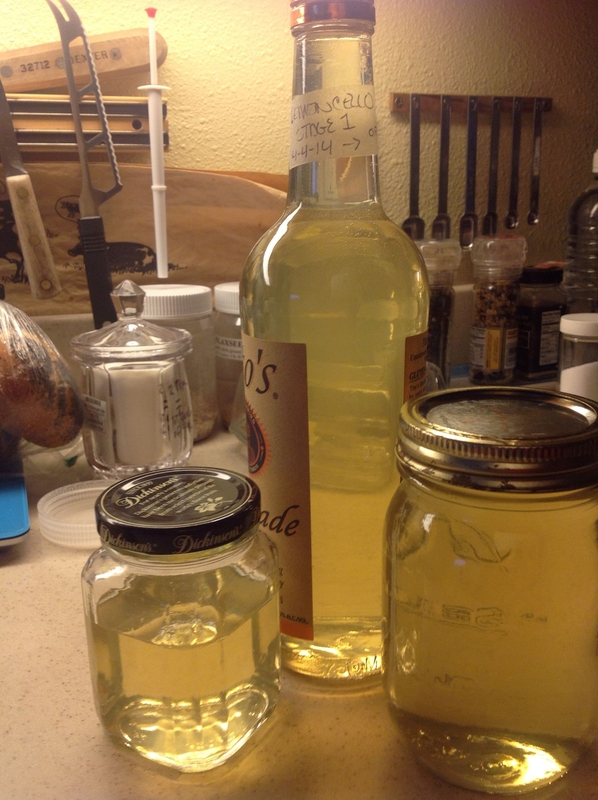 Lemoncello aficionados recommend a 2-step filtering process. The first step is to get most of the zest out using a fine sieve. Look at all of this zest! 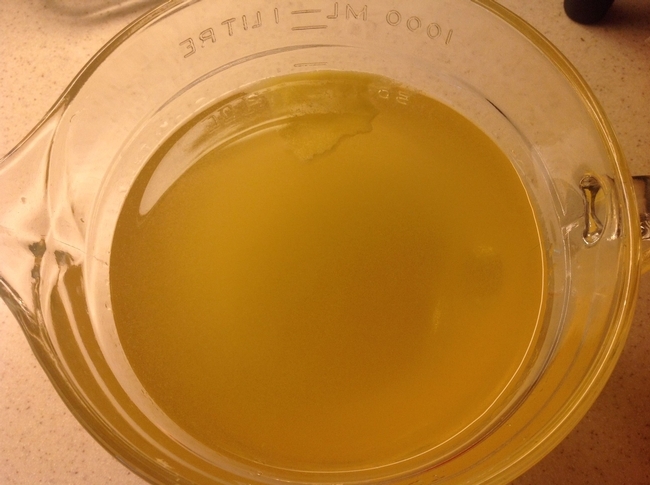 Quite a bit of solid material is left in the liquid after this process. 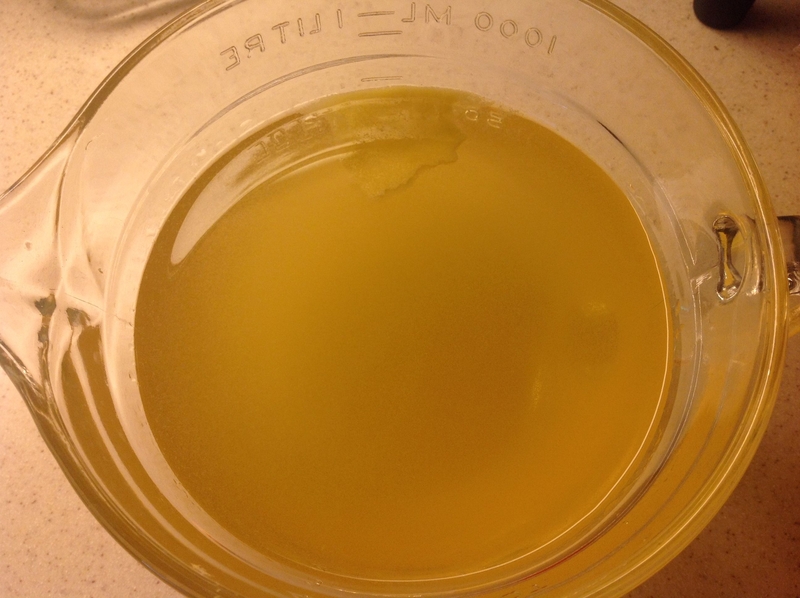 The next step is to add the cooled simple syrup. The basic simple syrup recipe calls for equal parts of sugar and water, but for lemoncello less sugar is used. For one 750ml bottle of base alcohol, you need 2-1/2 cups of water and 1-3/4 cups sugar. Add the sugar to the water in a medium saucepan and heat over medium heat. Bring to a gentle boil, stirring constantly, until the sugar is dissolved. 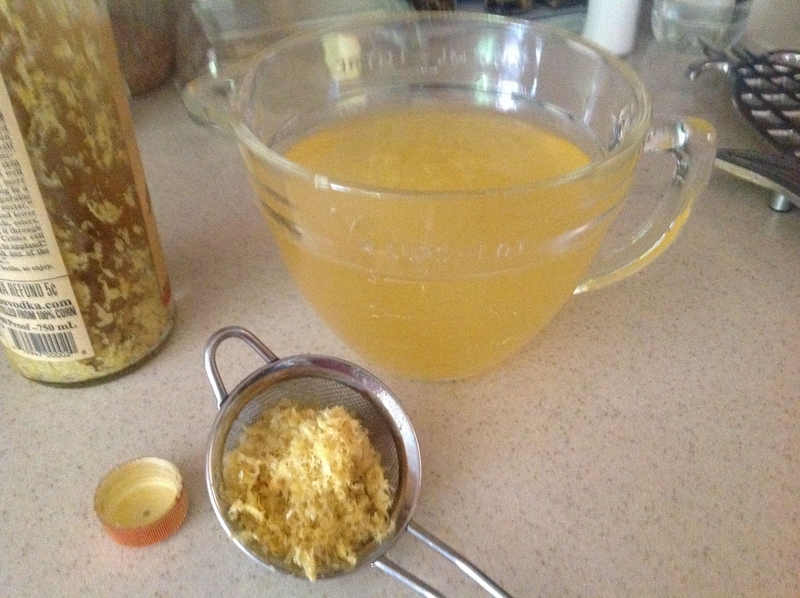 Let the mixture cool completely to room temperature before adding to the lemoncello base. Decant the mixture, and put in a cool, dark place for another 45 days. 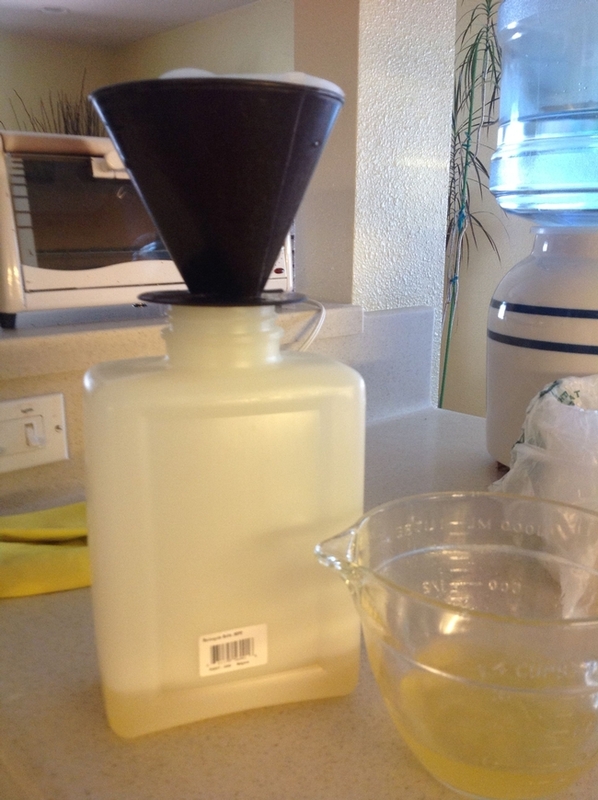 The addition of the simple syrup increases the volume, so you can't fit your mixture into the original bottle. This mixture was moved into two tall glass bottles and set aside until early July. 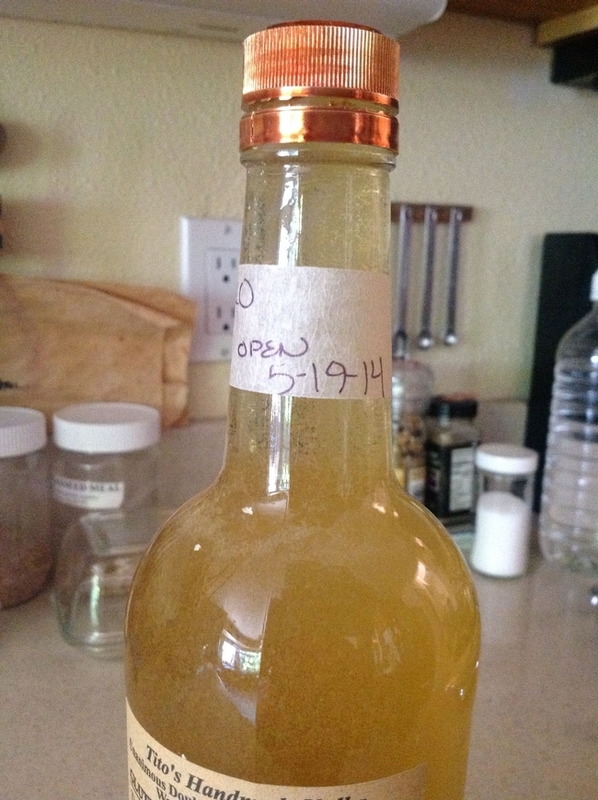 You can put the finished lemoncello in the freezer or in the refrigerator. Enjoy it alone or in a cocktail on a hot summer afternoon when you need a little something refreshing! If you want to make your own lemoncello, an excellent resource is the blog LemoncelloQuest. It's early spring, and that means one thing: I am once again drowning in lemons. This year with our tree well established, we had a bumper crop. Even as an espalier, our tree produces more lemons than we can use. And as anyone with a lemon tree knows - it's almost impossible to give away lemons. Lemons are the zucchini of winter. 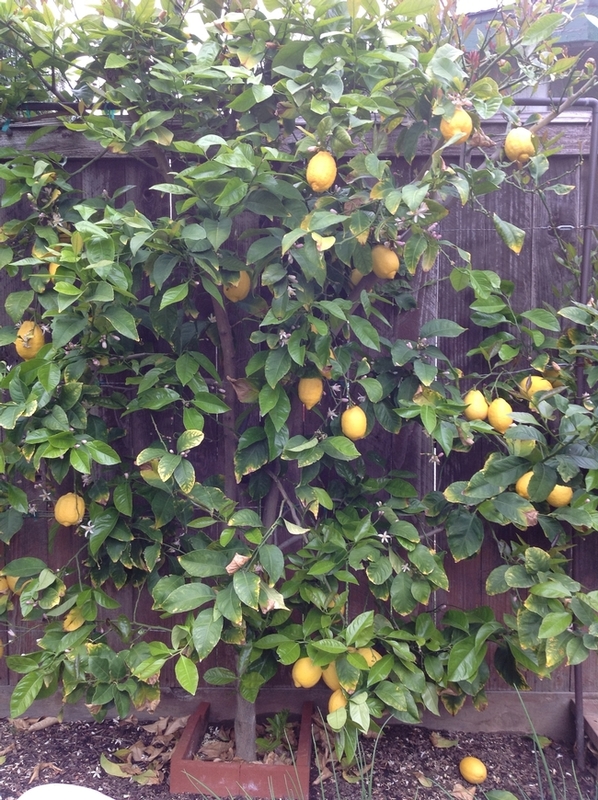 The author's backyard lemon tree trained in espalier style. With a pantry full of marmalade, a batch of salted lemons preserving, and all of the copper gleaming, I was looking for a new way to use my harvest. A neighbor told me she distributed all of her lemons by having a lemoncello making contest with her friends. Lemoncello, the Italian lemon liqueur, is gaining popularity outside of Italy. 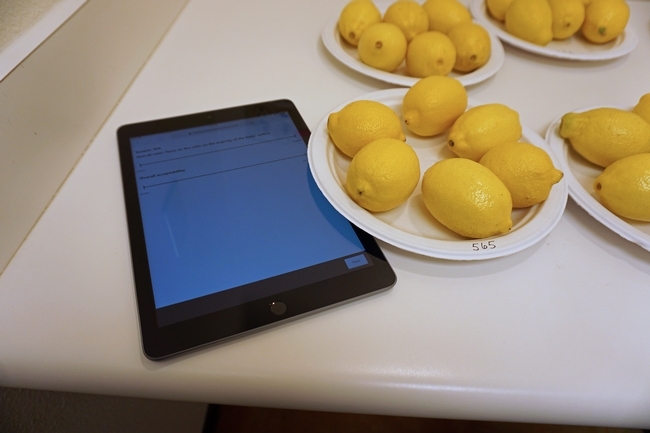 It uses a lot of lemons and is easy to make. The basic recipe for lemoncello is the same. Lemon zest, alcohol, simple syrup, and time. While recipes vary little, proportion and procedures are highly guarded secrets of the cognosenti. Purists insist on using a base of grain alcohol; it imparts no flavor of its own to the lemoncello letting the lemons shine through. Where grain alcohol is unavailable, a high quality vodka can stand in. I chose a hand crafted corn based vodka, distilled 6 times, because corn seemed the closest to grain alcohol and it had a relatively high proof. For my first try, I am halving the basic recipe. 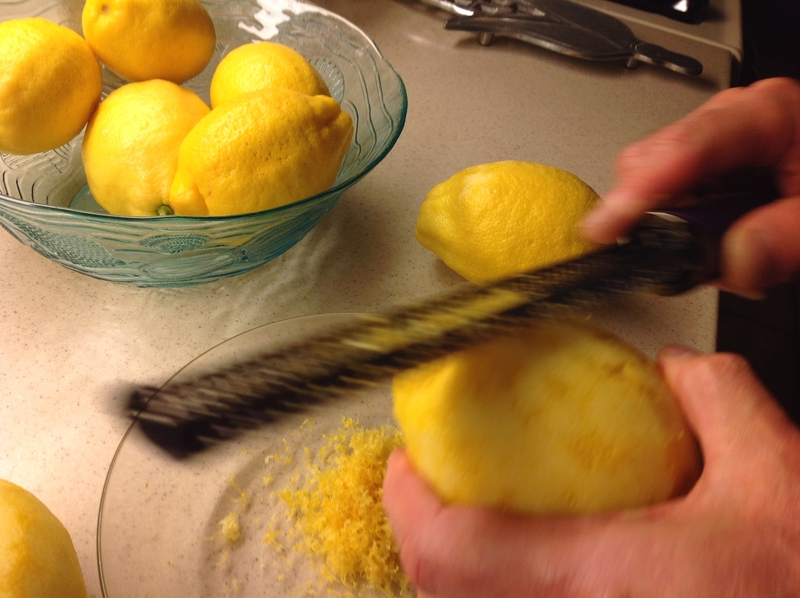 The first step was to zest the lemons. A lot of lemons. A microplane is a must-have tool as you want pure zest with no pith. 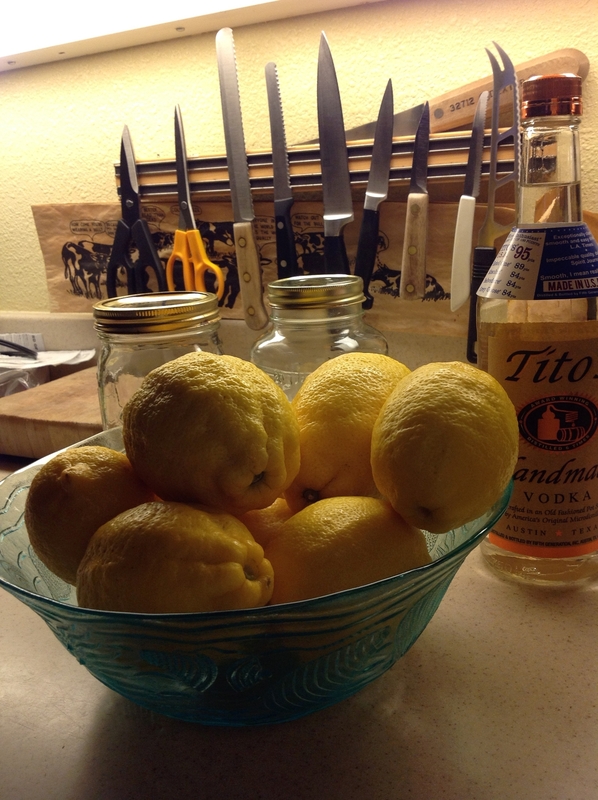 Add the liquor to the lemon zest. Put it a cool, dark place. Wait. 45 days. See you mid-May for the next step. P.S. After the original mixing of the lemon zest and the vodka, and on an apéritif roll, we decided to make vin de pêche using the recipe from Chez Panisse Fruit. 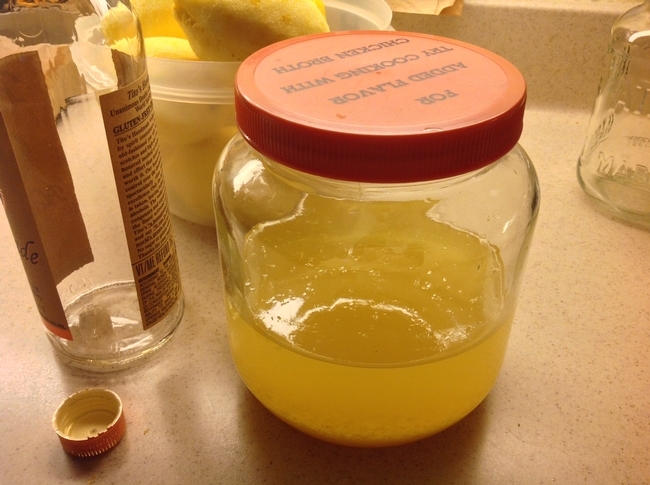 The large glass jar photographed above was re-purposed for the vin de pêche, and the vodka and the zest were moved into the empty vodka bottle. This is probably a better solution as there is less air surface in the container.